Groupon.com is having a Deals To Keep You Warm Sale. Save up to 80% off Activities, Dining, Beauty & Spa, Massages, Doorbusters, Apparel, More! Prices as marked. No promo code requires. Valid on select deals and in select cities. The sale is available for 2-days only from Sunday, January 20th to Monday, January 21, 2019. 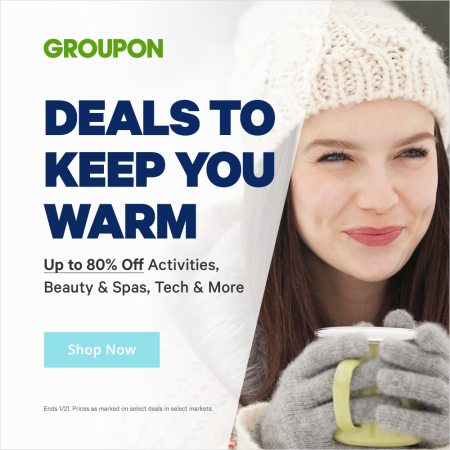 Click here to shop Groupon’s Deals To Keep You Warm Sale. Each city blog features the hottest local deals, sales, coupons and freebies in each Canadian city. Check out your city's blog and sign up for our e-newsletter so you never miss out on a hot deal! © 2019 Canada Deals Blog. All Rights Reserved.